Caribbean Heritage Festival, “Taste of the Caribbean”, Saturday June 4th, 12 Noon to 7PM, Bladensburg Park Water Front, Blandensburg, MD., 301-322-7497, Sponsor: The Caribbean Council of Prince George’s County, http://www.thecaribbeancouncil.org . Event is Free. Food and other vending charge by vendors. 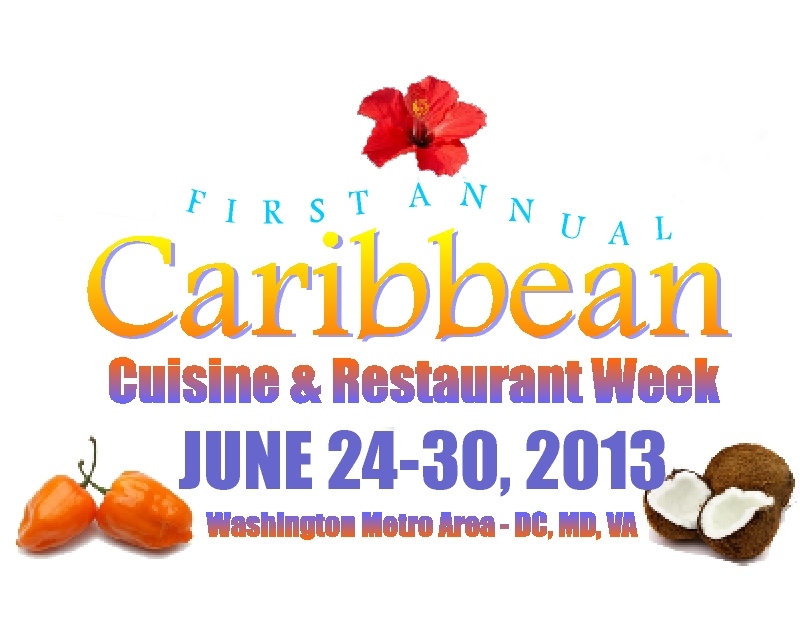 DC Caribbean Film Festival Opening Night – Tasting of Tropical/Caribbean Beverages, June 10th. Opening Night Film QUEEN NANNY: Legendary Maroon Chieftainess (Jamaica) w/filmmaker Q&A 7:30pm, VIGILANTE: THE CROSSING (Barbados) 9:30pm. AFI Silver Theatre and Cultural Center, 8633 Colesville Road, Silver Spring, MD. Tickets available at AFI Caribbean Film Festival. Sponsors: Caribbean Association of World Bank and IMF Staff, Institute of Caribbean Studies, Caribbean Professionals Network, Africa World Now Project. Past opening nights have introduced film-goers to tastings of Caribbean street foods with a nod to the country show-cased in the film. This year’s short break, between films from Jamaica and Barbados, will serve up a tasting of beverages unique to the Caribbean which use tropical fruits such as pineapple, guava, grapefruit, passion fruit, mango, June plum and coconut, and roots/ root vegetables such as ginger and carrot. Caribbean cultures share some breakfast staples and then there are dishes distinctive to each Island. Crown Bakery which specializes in Trinidadian foods adds bakes, saltfish, callaloo, coo coo, and buss-up shut (roti) to its all-you-can-eat brunch menu. Past folklore talks have included Trini-Americans sharing the diversity of their respective heritage—and the impact of the many influences, such as those of the Chinese, East Indian and Africans. Grace Jerk Festival, Sunday, June 19th, 12PM to 9PM, Pennsylvania Ave between 12th & 14th Streets NW, Contact: WWW.dcjerkfestival.com 718-425.1177, Co-sponsored by the DC Mayor’s Advisory Commission on Caribbean Community Affairs. Tickets Cost: $20 in advance $30 at gate. Food and other product vending charge by vendors. Caribbean Heritage Month Red Carpet Friday – Reggae, Soca & Jerk, Friday, June 24th Sandovan Restaurant, 4809 Georgia Avenue NW, Washington DC 20011, 202-248-2161 , 4pm – 2am. Sandovan’s name and menu is not only a fusion of its Caribbean and American heritage but also reflects the diversity of its Caribbean heritage. Sandy (American) and Donovan (East Indian-Jamaican) and their children have successfully mixed their collective food heritage with traditional Jamaican dishes such as jerk, rice & peas with basmati rice complemented by American dishes such as macaroni and cheese and spinach. Add to this menu is Chef Rox’s signature Caribbean artisanal drinks such as pine ginger and sorrel, and on Friday, June 24th, a special musical journey throughout the Caribbean. Out of many, one people. June is National Caribbean American Heritage Month. Experience a taste of the Islands! Enjoy special menus, distinctive Caribbean dishes and discounts at participating restaurants. Vote for your favorite restaurants and dishes. Learn about Caribbean foods, drinks & history. Grilling with Caribbean Spices, Wednesday, June 12 – 6-7:00 pm, Bazaar Spices at Union Market, 1309 5th St NE, Washington DC, http://www.bazaarspices.com The Islands of the Caribbean are known for their precious spices, such as nutmeg, mace and cloves from Grenada (often referred to as the Spice Island), ginger, pimento and sorrel from Jamaica, etc. Waves of migration to the Caribbean have also added to this profusion. Join Bazaar Spices at Union Market in welcoming Doreen Thompson, Founder of the Caribbean Food Alliance as she introduces us to the spices most often used in Caribbean cooking, particularly spices used to enhance your summer grilling experience. Come celebrate Caribbean Heritage Month with Bazaar Spices and check out this exciting event! History of Jerk, Thursday, June 20, 7-9 pm, Sweet Mango Café, known for their “world famous jerk chicken”, 3701 New Hampshire Ave NW, Washington DC, 202-726-2646 Most Americans were introduced to Jerk in the last two decades. Are you aware that this is a centuries old foodway or that the well-known African-American author, Zora Neale Hurston, participated and wrote about a jerking hunt on the islands in 1930’s. Have you wondered about the origin of the name? Is it related to jerky? What is the history behind this method of preparing meats? Come out to this lively discussion and leave with added knowledge and know-how about the contributions to “jerking” by two significant immigrant groups to the Caribbean.. Participants: Reginald James, Co-Founder/Owner, Sweet Mango Cafe (known for their “world famous jerk chicken”), and Doreen Thompson, Founder, Caribbean Food Alliance (NCAFFA), Member, Culinary Historians of Washington (CHOW) Introduction to Ital Cooking (Rastafarian Vegetarian), Friday, June 21, 7-9 pm, Sweet Mango Café, 3701 New Hampshire Ave NW, Washington DC, 202-726-2646 The history of Caribbean Foods often leaves out the contributions of the Rastafarians, who have been a cultural force in the Caribbean for decades. Most of us recognize their influences –dread locks, the signature red, gold and green berets and of course music and Bob Marley’s contributions. However, they have had a significant impact on Caribbean foods through their emphasis on vegetarian cooking. Participants: Misty Brown, Poet, Creole-Vegetarian Caterer, Reginald James, Rastafarian, & co-founder/owner, Sweet Mango History of Caribbean Foods with cookbook authors: Dorel Callender, A Caribbean Mom’s Table Traditional Recipes for the 21st Century & Beyond (Jamaica & Grenada), Marie-Louise Jean and Barbara Christophe, The Art & Soul of Haitian Cooking, Saturday, June 22 at 2:30 – 4 30pm, Sankofa Video & Books, 2714 Georgia Ave NW, Washington DC, 202-234-4755 Introduction to Traditional Trinidadian Breakfast & Folklore – Sunday, June 23, 11 am-4 pm (Performance 1-2 pm), Crown Bakery 5409 Georgia Ave NW, Washington DC, 202-291-3009 Celebration of Caribbean-American Culture & Foods, Friday, June 28th, 4-8 pm, Petworth Community Market, Georgia Avenue – Taylor & Upshur Like us on Facebook.